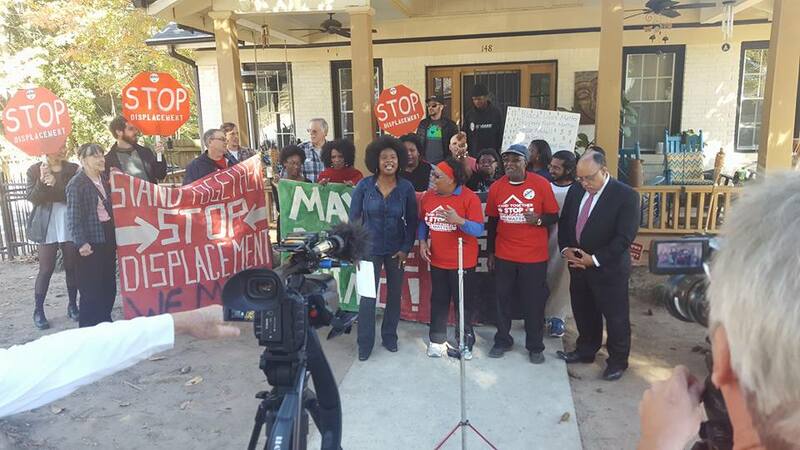 Peoplestown Residents Send Clear Message, "We will not be Moved!" On Monday, Nov. 21st, residents of Peoplestown and Housing Justice League members marched to the Atlanta City Hall to testify in front of City Council members who voted to authorize eminent domain proceedings against Mrs. and Mr. Darden and Tanya Washington. 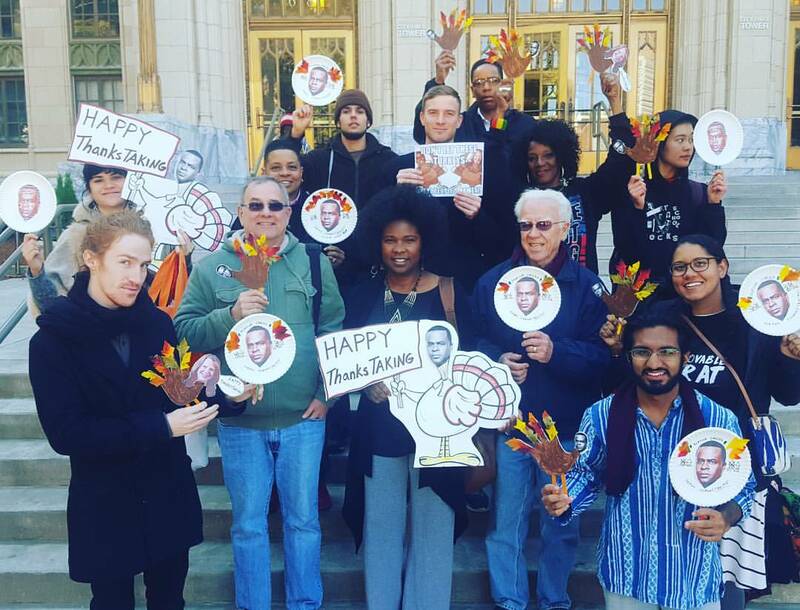 Protestors brought “Thanks-taking” themed posters plastered with the face of Mayor Kasim Reed, highlighting Reed’s gentrifying tendencies and impassivity in meeting with residents. The contingent group outside City Hall was only a small part of the 6,000+ signatories who signed a petition supporting Tanya and the Dardens’ resistance to displacement. Tensions came to a head in City Council, where individuals on both sides of the displacement issue spoke their opinions. Peoplestown residents who supported building the park, and thus the displacement of Tanya and the Dardens, reiterated their concern for flooding in the neighborhood and beliefs that park construction would subside flooding. They cited conversations with engineers and watershed department officials who suggested the park construction was a useful response to the flooding. Indeed, many of these residents were well-dressed white professionals. Following their narratives, Tanya Washington spoke. Many of her supporters yielded their speaking time, giving Tanya 16 minutes at the podium. Articulate, visceral, and honest, Tanya spoke about the timeline of park construction within the neighborhood and her commitment to staying in her home. Tanya highlighted that the current park construction plan was not the best plan possible. Initial drafts of park construction placed it close to the Turner Field stadium, away from the 100 block of Atlanta Avenue. She noted the City wished to advance this park plan because they had already displaced most residents on the block. “But going forward with a wrong displacement project doesn’t make it right,” Tanya noted. The city’s legal takeover of the block is un-coincidentally occurring with the sale of Turner Field, Tanya noted, and hints at a larger project of making over the Peoplestown neighborhood. This may not be problematic, except that it is happening at the expense of long-time black homeowners and for the benefit of wealthier white homeowners. The force of gentrification is heavily suggested by the fact that most of the pro-park advocates in City Hall were white, and at least in their immediate dress, white-collared, while the displaced residents have been older, black, and medium to low income. The City’s legal takeover of the Peoplestown block is a dangerous precedent in Atlanta, where resident-displacements in other neighborhoods, such as Vine City, are foreseeable and looming. Park development without displacement in Peoplestown is not only possible, but has been recommended. At the beginning of the building process, the Department of Watershed had nearly twenty-two site options to choose from when deciding a location. Building on some of these site locations would not have required resident-displacement at all. Nonetheless, the City advanced with building on the 100 Atlanta Avenue block, more or less evicting the majority of its residents. Even now, in the final stages of the block takeover, displacement need not continue. Housing Justice organizer Tim Franzen noted that developers already plan to build around resident Mattie Jackson’s home, which sits in the middle of the block. If this is possible, Franzen noted, it is also possible to build around the block-corner homes of the Dardens and Tanya Washington. Even amidst the City’s relentless displacements and subsequent public defacing, it is possible for the City to maintain dignity—by not displacing the Dardens and Tanya. 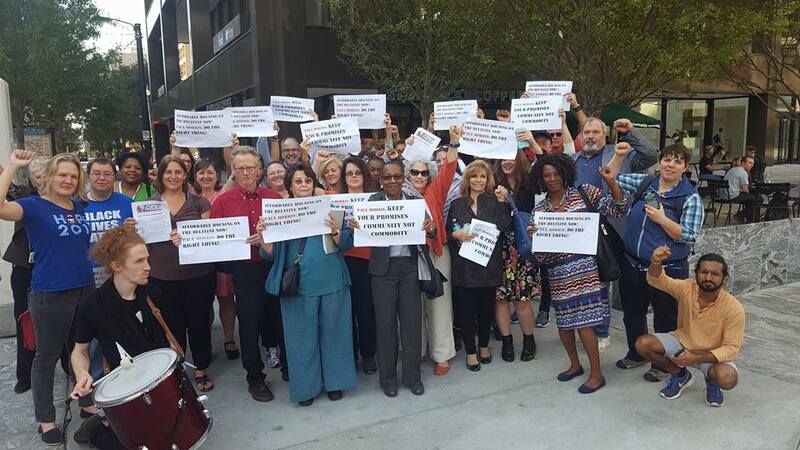 After the public testimonies, residents and Housing Justice members walked to Mayor Kasim Reed’s office in an attempt to meet with the Mayor and request his intervention in the eminent domain proceedings. His office doors were locked, however, even though Reed was visibly present in the mayor’s room. For half-an-hour, Housing Justice remained outside the office calling for the Mayor. But the Mayor’s Office denied communication, and Kasim Reed did not speak with residents. 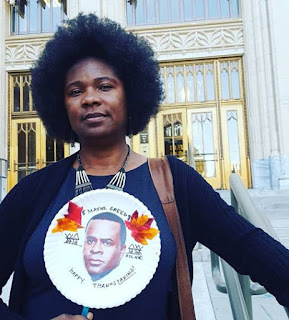 The eminent domain proceedings will be taken to court in the coming weeks, and Tanya Washington has promised a strong resistance. “These displacements are being fueled by a project of economic development rather than public safety,” she noted, “and will likely benefit private developers among others. Somebody is receiving large sums of money from this process, and it’s not the residents.” As Peoplestown residents continue fighting against displacement, the Housing Justice League remains relentlessly by their side. Testimonies and actions will continue as long as necessary to keep the Dardens and Tanya Washington in their homes. On Thursday, Nov. 17th, a group of Peoplestown residents and the Housing Justice League rallied together at the house of resident Tanya Washington, bringing attention to the eminent domain proceedings brought against Washington and her neighbors. In front of reporters and cameras from various television stations, Washington led the charge in explaining the issue at hand. The city of Atlanta is using “eminent domain” as a legal maneuver to redevelop a block in Peoplestown. The City cites street flooding as a primary reason for neighborhood redevelopment-- but it is simply a rouse. In the areas of Peoplestown hit hardest by flooding, notably the Turner Field stadium parking lots, the City has chosen to NOT redevelop. Early drafts by engineering consultants suggested a park and pond be built besides the stadium and AWAY from the neighborhoods. But, the City has avoided this, and chosen instead to forcefully displace Peoplestown residents so they may build atop their homes. 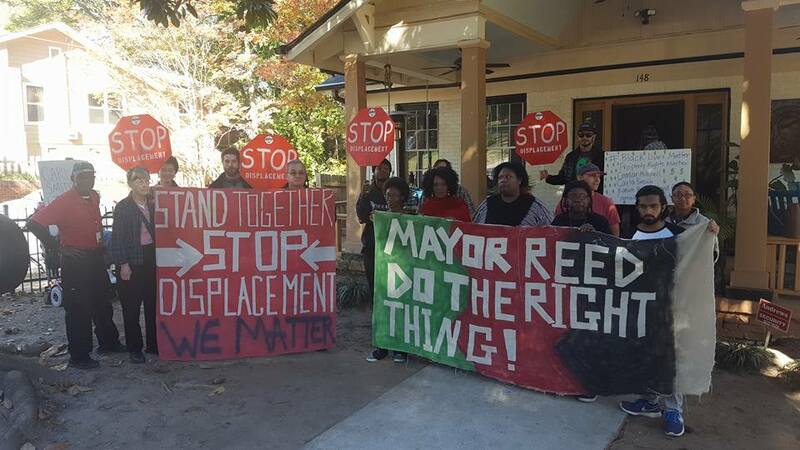 Alongside Washington, residents and allies held signs that read “Stop displacement,” “Mayor Reed, do the right thing,” and “Our homes are not for sale.” The rally echoed actions in the past, when housing justice members called Atlanta Mayor Kasim Reed to prioritize neighborhood residents over profit, and not displace people in the name of city beautification. Actions in this campaign once again will be directed towards City Hall and the Mayor’s Office, urging for policy that creates an Atlanta for all. Sign and share the online petition. 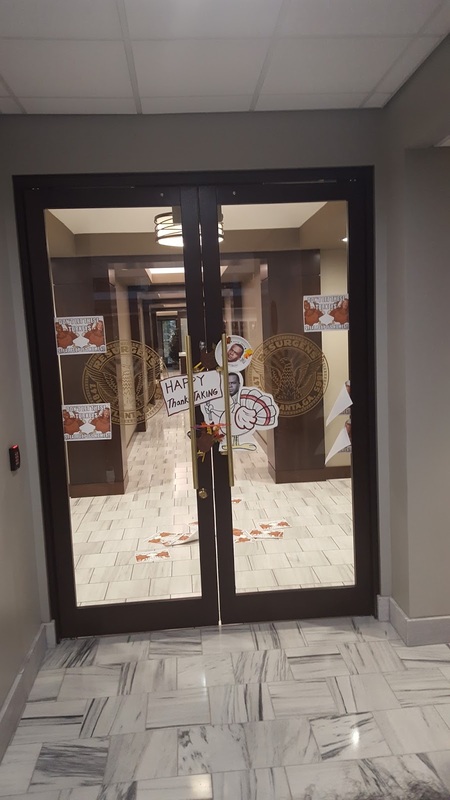 Action continue on Monday, Nov. 21st. 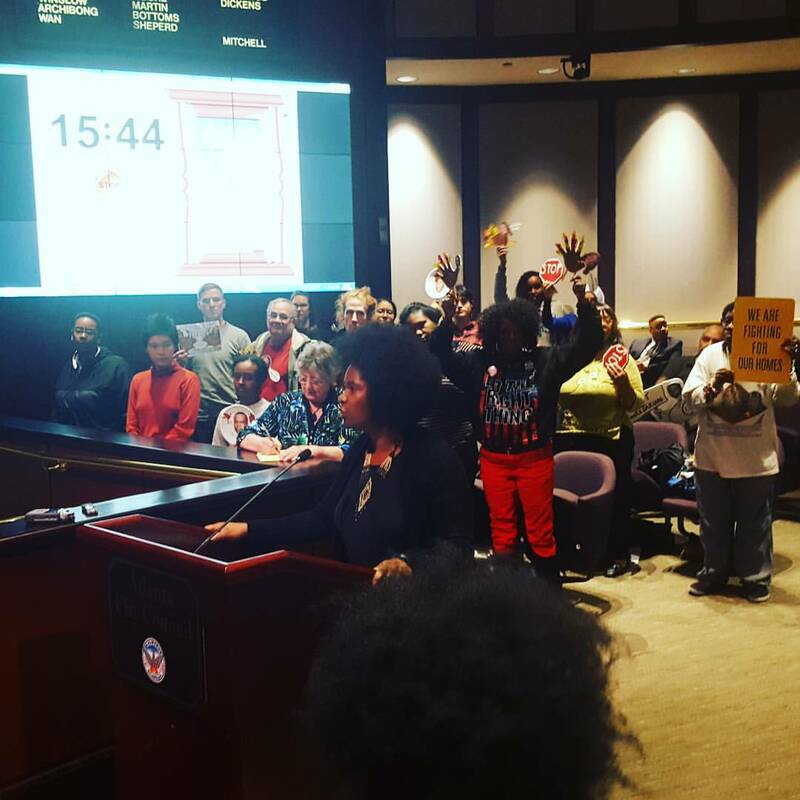 Residents and housing justice members will testify and protest against councilmembers who voted to put residents outside their homes-- including Councilperson Carla Smith who introduced the ordinance authorizing eminent domain in Peoplestown. This will be followed by a sit-in at the Mayor’s office to demand that he stop litigation and use his executive authority to keep residents in their homes. The Housing Justice League invites supporters to attend these events, and get out the word to friends, family and colleagues, in person, through phone, and via social media. The Atlanta Beltline, which oversees the development of a 22-mile loop through the city, says that it hopes to raise $7.5 million to encourage affordable housing development. But the recent announcement of $7.5 million from TAD bonds will likely support fewer than 200 affordable units out of ABI’s obligation to 5,600. When compared to the need, current funding is a drop in the bucket. As the economy comes back to life, and the city accelerates, meeting these obligations is increasingly urgent. It is clear the city of Atlanta has made little effort to hold Beltline developers accountable. 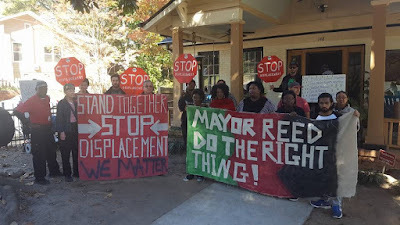 On Thursday, Nov. 3rd at 4 pm, the Housing Justice League held the Beltline accountable. 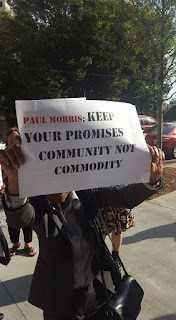 We organized a protest outside the Equitable Building on 100 Peachtree Street, home to the Atlanta Beltline Office, drawing public attention and criticism to Beltline President Paul Morris. The protest began with Housing Justice League organizer, and Stanton Oak tenant association president, Sherise Brown delivering a notification flyer to Paul Morris’s office. The flyer called attention to the lack of affordable housing on the Atlanta Beltline, and committed to hold Paul Morris and the entire Beltline Corporation accountable to their promise of 5,600 affordable units. Over the course of the next half-an-hour, protestors marched around the Building, registering their discontent with Paul Morris and the Beltline Corporation. Many of the protestors included university faculty, who were part of a Georgia State University-based conference on the housing crisis in Atlanta. The Housing Justice League is committed to keeping pressure on Paul Morris and his partner developers to build affordable housing on the Beltline. Up to this point, Beltline developers have built exclusively luxury housing units, creating a period of unbridled wealth extraction from communities that have only recently begun strong economic development. It is unacceptable for the Beltline to develop without accountability, and without profiting its surrounding neighborhoods. We demand that the Beltline be a project that benefits not just some, but all.